The closing date for applications is 28 June. Communicating the nature, sequence and impact of hazardous phenomena that occur during volcanic eruptions is a major challenge to volcanologists and disaster managers. Successful communication of the potential implications of such eruptive phenomena is essential in order to maximize risk reduction. Many volcanic hazards, such as pyroclastic density currents and lahars for example, are either unknown to, or are very poorly understood by the general public. Furthermore many of the people at threat - who live in areas around these volcanoes, particularly in developing countries - are unfamiliar with using traditional 2D depictions, such as hazard maps. Some research indicates that 3D visualizations are a more effective way of communicating hazard information than 2D maps (e.g. Haynes et al 2007). Specifically, this studentship will generate interactive 3D computer visualizations of hazards from potential future volcanic eruptions. It will build on expertise from the ‘Interactive Systems Studio’ at Plymouth University, which specialises in virtual and augmented reality solutions for public engagement using web and mobile technologies and will be underpinned by the School of Geography, Earth & Environmental Sciences growing reputation in geoscience outreach. ‘Communication Analysis’ work package. The STREVA project will implement new methods and techniques developed for hazard and risk analysis and communication at a range of volcanoes in the greater Caribbean region. Therefore this studentship will make use of this excellent opportunity of timely integration with relevant on-going risk reduction research. In conjunction with the STREVA consortium, develop potential eruption scenarios at a STREVA volcano e.g. Soufriere (St Vincent, West Indies), Cerro Machin (Columbia), and Cuicocha (Ecuador).  Evaluate results of usability testing to inform future development of interactive 3D visualisation for public engagement. 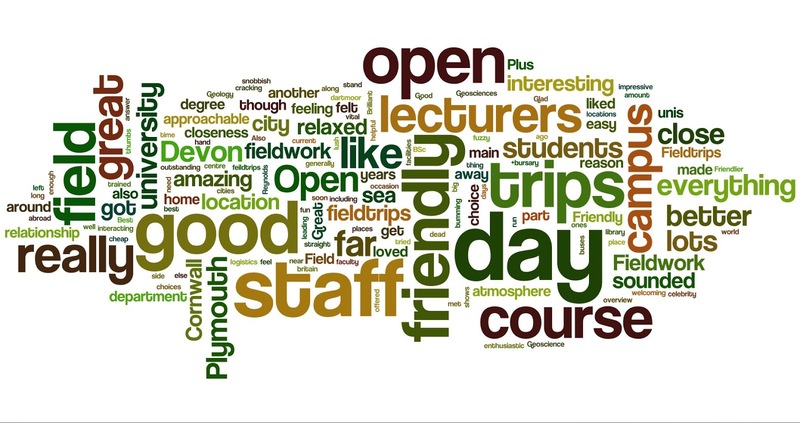 We're trying to figure out the reasons why students come to do geoscience with us at Plymouth. So, simple question: Why did you choose Plymouth? No major essays - just a sentence or two pls. I'll out the list together and re-post. Thomas Wood Friendly, professional, knowledgeable and world leading staff. Tons of vital fieldwork to great locations. 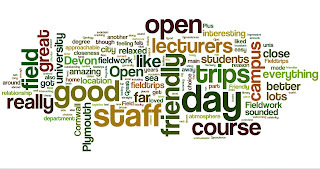 Daniel Reynolds Field trips, attitude of the lecturers and it put on an outstanding open day. Daniel Reynolds also cheap and fun nights out! Matthew Catterall Location looked awesome, prospectus really made it stand out from the other unis! David Chapman The staff were very friendly during the open day. Everywhere else felt very formal but Plymouth made me feel like I was part of the department straight away. Victoria Marks Open day! It was a friendly, relaxed environment with lecturers interacting with potential students. I like the tour of campus as well, it shows that everything is close to hand. You don't need to get buses from one part to another like in some cities. Darrell Fuller Open day for me relaxed, friendly and generally good. Plus the campus is pretty impressive. Hope Thomas Great open day, friendly staff and it was very sunny! Felt like people and place I could spend 3 years with, and a good course of course. Philip Green I loved the location so close to Cornwall and the facilities were really good along with friendly and helpful staff. Megan Heather Open day was amazing, just got a really welcoming feeling from the staff and current students sounded really enthusiastic about the course. The field trips (+bursary) was a big plus and I liked how everything was close together but you weren't far away from the countryside. Tracy Aze It was a university in Devon, and Devon is lush! Ashley Tarr Because it is near Cornwall and the surf is great! Hope Thomas The open day was good because there were so many staff there, most unis only send a few. Sarah Baker The open day was really good, lots of field trips including ones abroad, and the staff seemed really friendly and good humoured! Callum Hatch The course seemed to be better run and managed than it was at the other university I was looking at. Magnus Worthington One word: Fieldtrips! Amir Abbasi Fieldtrips, and attitudes of the lecturers and staff. Lucy Cotton Field trips are the main reason for me, and now I am here another great thing is is the relationship students develop with the lecturers. Many other students don't have the amazing field tips and lecturers. Claire Lawrence It felt like home as soon as I arrived :-) I loved everything about it, the closeness of the HoR to campus, the closeness of the town centre. The course was amazing with such a good overview of the subject. It was thumbs up all over! Jack Cottam Decent amount of field trips, friendly atmosphere and nicest sandwiches of any uni open day I had been to! Lucy Cotton Brilliant spread at every occasion. Susan Bullock Nash My options were Plymouth or Marjons because of logistics, and the Geosciences Dept at Plymouth seemed far better equipped with better choices of modules. Ross Laidlaw Fieldwork and the campus was in the perfect location. Plus Colin sold it to me!! Ian Rogers A city by the sea with an acceptance criteria that suited me. Chris Facetious Cook Great industry trained staff, not snobbish like Exeter, good field trips, great university in a good city. The friendly approachable relationship with lecturers is also important. Roy Rule Not first choice: but when you have the moors on one side and the sea on the other, and the best fieldtrips in britain, Who cares?! Eleanor Cronin The staff seemed the most approachable of all of the faculty I met at the other open days. Also the field trips sounded interesting and relevant. o Joseph Richardson The fieldwork definitely. By studying at Plymouth I visited Spain, Sicily, Norway and the USA, along with a few closer to home. 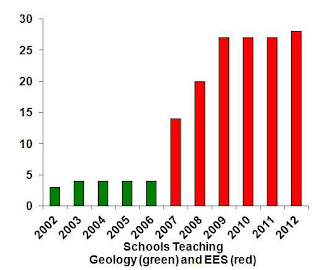 In 2006, something dramatic happened in geoscience education in Western Australia. That year, the long standing (and mandatory) provision to teach Geology at Year 11/12 (equivalent to UK Key Stage 5; A-Level) was terminated. A subject which for years had struggled with falling numbers among students and schools seemed to have been finally put out of its misery. “Interest and awareness of geology in high schools in WA - the world’s leading mining and exploration province, is at a low ebb with only five schools currently teaching the Geology Course” lamented Jim Ross, the Chair of Earth Science Western Australia (ESWA) (1,2). With its demise, Geology in WA was destined to have its key components buried within a new module: ‘Environmental Science’. ESTWA - a consortium representing the University of Western Australia, Curtin University of Technology, CSIRO, the Geological Survey of WA and the WA Museum - took up the fight. Alarmed by the possibility of Geology slipping under the radar of school students, they campaigned to help redesign and write the curriculum for the new course and successfully lobbied to change its name. The resulting ‘Earth and Environmental Science’ now delivers 50/50 geoscience and environmental science content. The effect of this new branding of Geology has been truly transformative. 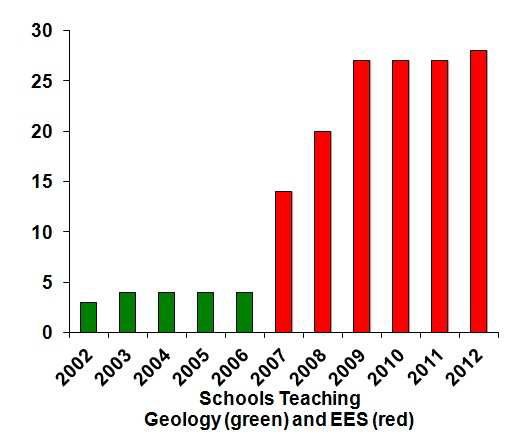 As the graphs below show, the transfer from the old Geology course to the new Earth and Environmental Science course in 2007 saw a huge boost in the number of schools and students having access to geoscience. 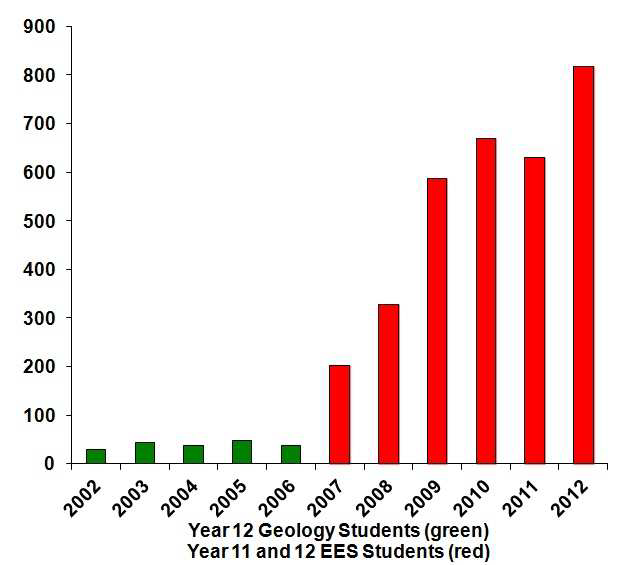 Figure 1: Plots showing the uptake of ‘Geology (green) and )’Earth & Environmental Science’ (Red) amongst students (left) and schools (right) in Western Australia. 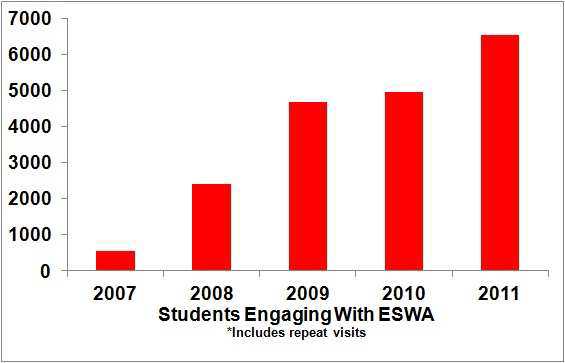 What’s more, this increase has continued apace with a rising engagement of schools in ESWA’s geoscience outreach programmes, not just at lower Secondary level but also at Primary too. Such is the remarkable reversal in fortunes for geoscience in WA that many of Oz’s east coast states - equally afflicted by dwindling geoscience school numbers - are thinking seriously about going down the same rebranding route. Figure 2: Plot showing increasing schools engagement with Earth Science Western Australia activities following the 2007 introduction of the Earth & Environmental Science course. The concern amongst professional Earth scientists and Geology classroom practitioners north of the border is that any decline at secondary school level will quickly impact on the vitality of the university sector. “Uptake of university places in Geology, Earth sciences and Geosciences are related to the numbers enrolled in upper level qualifications in secondary school... Without Higher Geology, the numbers of Scottish pupils enrolling in undergraduate Geology or Earth science degree courses will drop, and the production of qualified Scottish geologists ready for careers in the biggest sector of the future Scottish economy will drop.” (3). In contrast to Western Australia, Scotland’s new Environmental Science A-level is taking shape with minimal geoscience input, suggesting that any tartan resurgence in Geology is some way off. At first glance, the situation in England & Wales looks far rosier. GCSE, AS and A-level numbers are climbing, reversing what had previously been a long and steady decline. 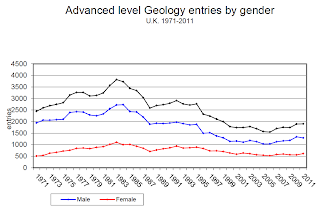 At Advanced level uptake in Geology is even outpacing its nemesis, Environmental Science. It is easy to speculate as to why Geology might be viewed by admissions tutors as not being especially facilitating. After all, having a Geology A-level probably means coming in to geoscience with one less Science, which could limit students in some aspects of the sprawling, inter-connected multiverse of Earth system science. Also, an entry cohort with a mix of students with and without advanced level geoscience is tricky to cater for at the introductory level. Finally, there could be concerns either that the A-level syllabus might not be adequate preparation for the rapidly evolving and ever more specialised geoscience curriculum at university, or that out-of-date thinking among A-level teachers may end up instilling misconceptions that are hard to shift later on. Whatever the issue, the relegation of Geology A Level to simply being ‘useful’ for pursuing a career in geoscience means that students and parents are likely to be confused as whether or not it is worthwhile selecting at all. 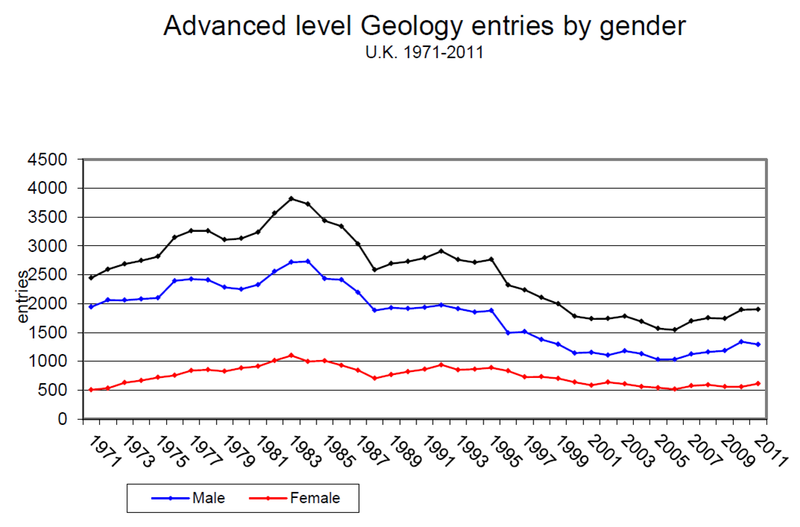 And yet, currently, it is that A-level that is underpinning our rising Geology numbers. According to Chris King at Keele University’s Earth Science Education Unit (pers comm), the latest UCAS figures show that last year 43% of applicants to UK geology courses had A-level geology and 30% of applicants to all UK geoscience-related courses. Any appreciable switch away from Advanced Geology in secondary schools is likely to have an immediate knock-on effect on university numbers. 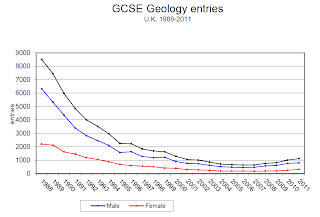 According to Stimpson, the UK Geology Teacher is an endangered species. The irony is that, adept at cajoling countless students into the damp rigours of fieldwork or the intimate revelations of rocks, Geology teachers would seem to have been an integral part of Geology's resurgence in recent years. To expect Chemistry, Physics, and Biology teachers to launch repeated waves of students into university Geology departments is short-sighted and naive. Our best advert for our subject, is ourselves. I'm grateful to Joanne Watkins at ESWA for introducing me to the remarkable turnaround in WA Earth Science fortunes during a recent visit to Oz, and for supplying the graphs above. Chris King kindly supplied the UK schools data. Email discussions with Peter Harrison, Keith Turner and others on the Scottish Geodiversity Forum helped crystallise thoughts with regard to the 'Scottish scene'. (3) Robinson, R., Harrison, P. & Banks, J. 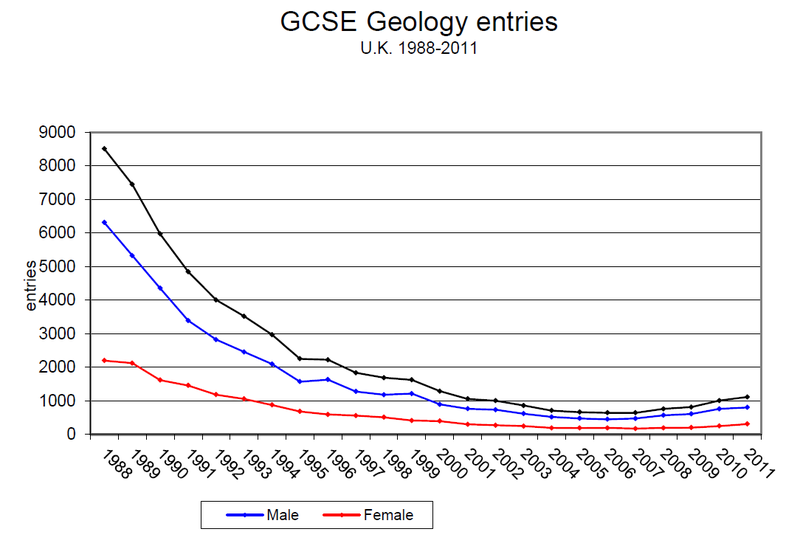 Higher Geology and Earth Science Provision in Scotland. Post November 23rd 2012 Meeting paper. (3) Informed Choices: A Russell Group guide to making informed choices on post-16 education. http://www.russellgroup.ac.uk/media/informed-choices/InformedChoices-latest.pdf).